I just converted this blog from a dynamic Enki site to a static Jekyll one. I wanted to get rid of the comments, add SSL, and not have to upgrade Rails so often. I prefer composing locally also. 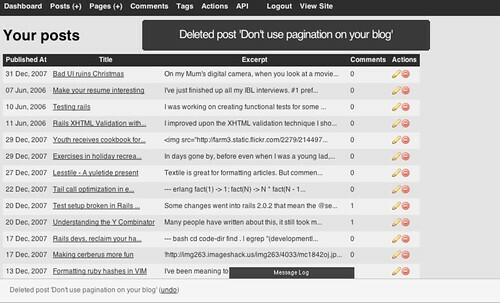 First, I exported all of the posts to lesstile templates using a rake task. The permalink configuration option needs to be set to match existing URLs, and to create the tag pages, use the jekyll-archives plugin. For a full example, including a recommended set of layouts and includes, see the new sources for this site. Of course there’s still more I’d like to add (in particular to do with tags), but isn’t that always the case? I think it’s pretty swish – if you’ve already got an install just pull from master, if you think you might like an install, head over to the Enki website. Finally got this blog switched over to Enki. Main feed has moved to feed burner. Please report any weirdness to the relevant authorities. I’m going on holidays until the end of January. The off line kind of holiday where I don’t see a computer. So sad. So here is a tasty treat for you to devour until I return. A sneak preview of a Fashionable New Blogging App™ named Enki. It is an alternative to Mephisto and SimpleLog that is built on the principles espoused in my prior writings. The website is built using Enki itself, and the port of this site from mephisto is just about finished, so you know you’re getting code that’s got a real life application. There’s still a few rough edges, but it’s ready enough to start building something with if you don’t mind getting your hands a little dirty. I’ve set up a mailing list for it which I’ll be catching up on once I get back.